Archbasilica of Saint John Lateran is the oldest christian church in Rome. For this reason it’s considered the mother of all churches in Rome and worldwide. Built during the IV century by Costantino, it used to be the main place of worship up until the end of 300. The beautiful facade, with 15 enormous statues on top (representing Jesus with Saint John the Baptist, Saint John the evangelist and the 12 apostles) will guide you in the magnificent rooms, renovated with baroque flavour by Borromini. The world’s tallest obelisk and Palazzo Laterano. 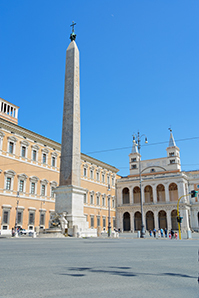 Once you get to the Basilica, we recommend you to stop at San Giovanni in Laterano square and admire the oldest obelisk in Rome which is also the tallest in the world. Built in the XV century B.C., it’s 32,18 metre tall, 45,70 including the cross on top. On the square, next to the Church, lies the Palazzo Laterano which used to be the Pope’s dwelling for over a thousand years and serves today as Headquarters of the Parsonage and of Diocese’s offices of Rome. The baptistery. The baptistery stands tall next to the northern facade. Its octagonal structure was used as a model for all baptisteries built during the following eras all over Italy. Via Sannio’s market. Right next to San Giovanni’s subway station, on the Coin store side, there’s Via Sannio with its traditional open market for clothing. It used to be low cost and fashionable during the 60’s and the 80’s. Nowadays prices have risen a bit. There you can find both used and brand new clothes, both big brands and forged brands, military style clothing, shoes, handbags and belts.You will find the best bargains right at the end of the market. There you will find used clothes in excellent state for prices ranging from 2 to 10 Euros. In any event, we recommend you to always try to negotiate the prices: it usually works. Watch out for shady people looking for scams at the market entrance. Dress code. In churces access is forbidden if your arms and legs are not properly covered. Pants or long skirts are required to get in. Your shoulder also must be covered. Otherwise you will be denied access to the Archbasilica of Saint John Lateran. So trust us, follow the dress code and you won’t miss out on all the art that is hidden into the thousands of Churches of Rome. The holy door. The door at the right end is open only during Holy Years. The myth. From the colonnade you can access the Archbasilica of Saint John Lateran hall thorugh five different doors. According to the old myth, if a pregnant woman touches the main bronze door (the middle one) she will give birth to a baby boy. Camera. Don’t forget your camera: you will want to take a shot of the Church’s facade or of the world’s tallest obelisk! Scarf or jacket. During the summer we recommend you to bring with you a scarf or a jacket to cover your shoulders when you enter the Church. The Church is open from 7 am to 6:30 pm; the cloister is open from 9 am to 6 pm. Access to the baptistery is from 7 am to 12:30 pm and from 4 pm to 7 pm. Access to the Archbasilica of Saint John Lateran and the Baptistery is free of charge. Subway. The simplest and fastest way to get to the Church is by subway A line. The subway stop is San Giovanni.. Bus. The 81, 85 and 714 lines stop by the Basilica.